A federal grand jury will soon begin hearing evidence about Rep. Cynthia McKinney's run-in with a Capitol Police officer, a lawyer familiar with the case said late Wednesday. The lawyer, who declined to be identified because of grand jury secrecy, confirmed that federal prosecutors had agreed to get involved in the case in which a black lawmaker is accused of striking a white officer after he tried to stop her from entering a House office building without going through a security checkpoint. U.S. Capitol Police Chief Terrance Gainer said McKinney turned the officer's failure to recognize her into a criminal matter when she failed to stop at his request, and then struck him. "He reached out and grabbed her and she turned around and hit him," Gainer said on CNN. "Even the high and the haughty should be able to stop and say, 'I'm a congressman' and then everybody moves on." "This is not about personality," added House Speaker Dennis Hastert, R-Ill. "It's not about racial profiling. It's about making this place safer." For her part, McKinney wasn't backing down from the argument. She charged anew that racism is behind what she said is a pattern of difficulty in clearing Hill security checkpoints. "This has become much ado about a hairdo," she told CBS News' The Early Show. McKinney, a Georgia Democrat, recently dropped her trademark cornrows in favor of a curly brown afro. The police aren't the ones who are racist, one Republican said. "Cynthia McKinney is a racist," Rep. Tom DeLay, R-Texas, said on Fox News Channel's "Fox and Friends," a day after abandoning his reelection bid under a cloud of ethics charges. "She has a long history of racism. Everything is racism with her. 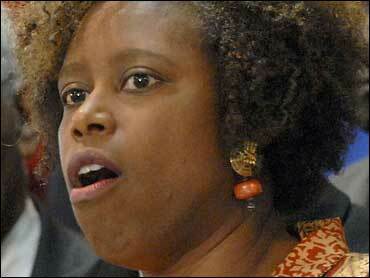 This is incredible arrogance that sometimes hits these members of Congress, but especially Cynthia McKinney." Last Wednesday's incident in a House office building has caused a commotion on Capitol Hill, where security in the era of terrorist threat is tighter than ever and where authorities had to order an evacuation just Monday because of a power outage. Capitol Police have turned the case over to U.S. Attorney Kenneth Wainstein, who must decide whether to clear the way for any charges against McKinney. An official in his office said no announcement was expected Wednesday. McKinney has garnered little support among fellow Democrats in her feud with the Capitol police. No one in her party chose to join her at a news conference last Friday to discuss the situation. Republicans, meanwhile, presented a resolution commending Capitol police for professionalism toward members of Congress and visitors, even though they "endure physical and verbal assaults in some extreme cases." "I don't think it's fair to attack the Capitol Police and I think it's time that we show our support for them," said Rep. Patrick McHenry, R-N.C., a sponsor of the measure. Ignoring a police officer's order to stop, or hitting one, "is never OK," McHenry said. Some GOP members have said the McKinney incident serves to underscore Democratic insensitivity to security concerns. Gainer said that racism, however, was not a factor. "I've seen our officers stop white members and black members, Latinos, male and females," he told CNN. "It's not an issue about what your race or gender is. It's an issue about making sure people who come into our building are recognized if they're not going through the magnetometer, and this officer at that moment didn't recognize her." "It would have been real easy, as most members of Congress do, to say here's who I am or do you know who I am?" Gainer added. Police also have said that McKinney was failing to wear a pin that lawmakers are asked to display when entering Capitol facilities. But she said Wednesday: "Face recognition is the issue .... The pin doesn't have my name on it and it doesn't have my picture on it, and so security should not be based on a pin ... People are focused on my hairdo." "Something that perhaps the average American just doesn't understand is that there is a heightened sense of a lack of appropriateness being there for members who are elected who happen to be of color," McKinney said, "and until this issue is addressed by the American public in a very substantive way, it won't be the last time."